Want to buy some money? Have I got a deal for you!!! Why, here, for a mere $1000, you can buy a 100 rupee note. Hard to believe isn't it? The deal of a lifetime!! Here now is the Osmania Princely State of Hydrabad 100 rupees note, 1332. Get it here now, while supplies last!! The date 1332 is from the Islamic calender. It converts to the year from November 1913 to November 1914 on the modern calender. Many so-called experts cannot read numbers in Arabic (I can) and have given wrong dates for this note. The number "1332" is clearly written in Arabic on the bottom line left of center on the front page of the note. 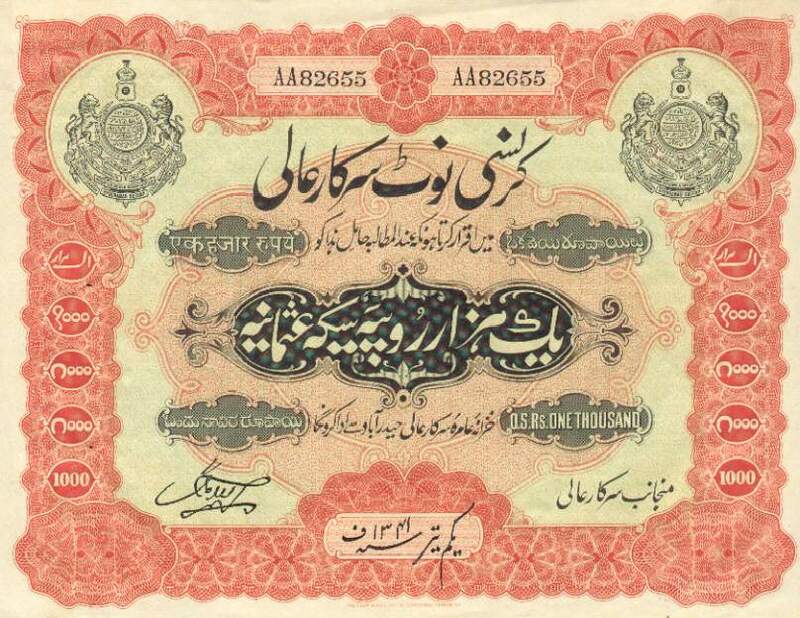 Princely State of Hyderabad 100 rupees note 1332 CH UNC PS 266d , ND (1923), XF in Pick is $275 for XF. Pick does not give a value for CH UNC. A beautiful note by Waterlow & Sons, unknown in CH UNC, Serial #91906, without staple holes as found on other India notes. Pick says that this note was issued in 1923 and has no date. 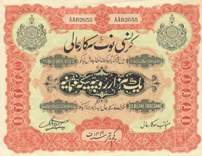 However, the date on the note in Arabic script is 1332. 1332 on the Islamic calendar coverts to 1913-1914 on the modern calendar. Therefore, this note appears to be ten years older than Pick says. Probably, the people at Pick could not read Arabic. Princely States, Rp 1,000 PS # 267, sign C, SN#AA82655, by Waterlow, XF in Pick is $500. This is a Choice AU/UNC 2 tiny pin holes on the left side. Burma (Myanmar) Under the British Rp 100, SN# t41/744885, with "Legal Tender in Burma Only" overprint RANGOON, Pick #3 ND (1937) has three vertical and one horizontal fold, VF. Pick lists this note as "Rare" but does not give a value. Another exact same Burma note was in Singapore auction, March 2000, Lot #1184 with Estimate $4000/5000 & described as "a very rare note" & had Ser. # t/41-774883. This is t/41-744885 ! A rare note until a few years ago when somebody flooded the market with them. They are now beginning to recover in value. 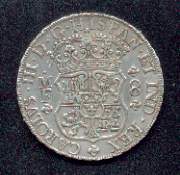 The smaller denominations of this bank occasionally appear in the Spink etc. auctions in Honk Kong and Singapore but the $500 is unknown anywhere. What are your comments about these currency and coins? Mint S.C. $1 Proof, 4 vignettes including slaves, red! Gem Exch Bkg Hse Indianapolis $1 w train vignette! Scarce XF Berkshire Bk $3, all green, 3 vignettes, wow! 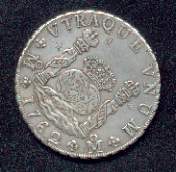 Scarce Gem CU 1778 S.C. 3s9d, a beauty! Rare Hartford, Indiana $3 w lg train vignette, ALL RED! Ultra ornate Tecumseh, Mi. $5, super vignettes, ALL GREEN! Gem NJ $50 proof w 3 lg vignettes & red overprint, ultra ornate! Scarce, fully iss Ch AU 1861Bk of Wash, NC $100, a beauty!